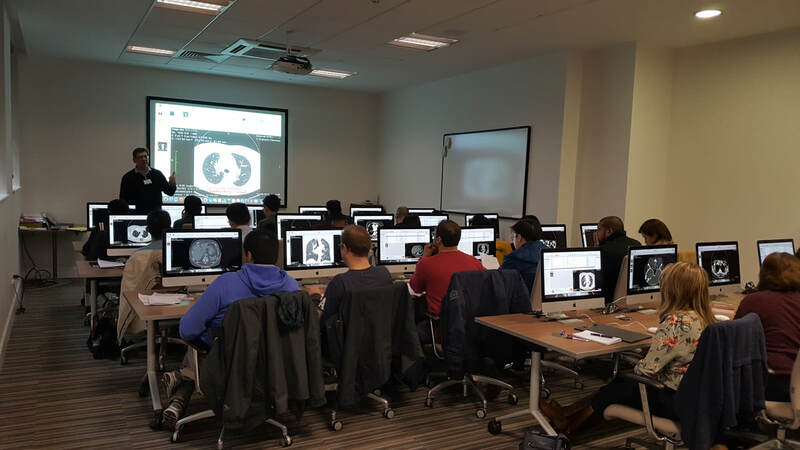 The Grayscale Written Course arose as a direct request of many candidates attending the 2 day viva course, that wanted more preparatory teaching, in the same style as the viva course, for the Written part of the exam. There is no overlap between this course and the original course or the rapid reporting course. The course can be taken with or without the 2-day original or rapid reporting course. If you are also taking the original 2 day course it does not matter if you take this course before or after the 2-day course. This course prepares candidates for the written reports part of the exam. It is run on individual 21.5inch imacs running Horos (Osirix). Answers are typed to simulate the exam. The course is designed to show you how to maximise scoring on a part of the exam where most candidates score 5.5-6 but where most candidates could improve by at least 0.5 marks by following our guidance for image review and answering. During the day strategies for rapid image review, identification of combination findings, classic cases, and typed test completion to maximise scoring are highlighted. The course includes a pre-course marked written exam, with personalised feedback, and a post course further written exam. Candidates have revealed that they scored highly as a result of this course. As is the case with the viva course this course was set up to address the limitation of existing courses with respect to what trainees fully need. Most courses are simply assessment courses. You complete an exam, you may get a few words of advice, and you move on. The first problem is that you do not get taught. The second problem is that the advice you may get is of variable accuracy and quality. Finally, its not personalised to you. If you have a large course run by a hospital/department, you need lots of examiners and invigilators. Your first obligation, to keep the peace, is to invite your colleagues to examine. Then you will need external people. What do you do when they can't make it? You fall back on more and more junior people and even registrars. Some of those may be excellent teachers, others may think they are, and some clearly are not! That is the problem, the variability. That is not to say that they are not good radiologists, some will be exceptional, but teaching is a different skill set. That skill set comes from a love of teaching, caring for trainees, having experienced great and varied teaching yourself, and just being inherently good at it yourself. It doesn't come from being the "head" of anything, or having a teaching certificate. It is an intrinsic quality that is verified only by those that you teach. The Grayscale faculty have a track record of teaching verified by awards, in the UK, and internationally. Dr Vlahos set up these courses and personally selected and directed the exceptional current Grayscale faculty to deliver courses and the material in the same way. The faculty will continue the legacy of continued improvement of the materials and teaching experience based upon their broad subspecialty skills and exciting educational repertoire of the new faculty. Explore the "about us" section and the prior course testimonials to find out more. Although the long cases are sometimes comparable to the viva cases it is an often stated fallacy on courses that any viva case can be a long case. These cases are selected for particular reasons, to have multiple findings, observation or analysis points that can be worked through without any support or guidance from an examiner. You are not guided towards or away from analyses that may waste your time. Simplistically the best advice given is that you must finish the cases. This is certainly paramount, but does not address the question of why you run out of time in the first place. How do you comprehensively review a case with perhaps two examinations, analyze them, make clinical recommendations and type it all up in the time limit? You probably would not issue a report in this time frame in normal life. This course highlights how we teach trainees to review cross-sectional imaging. How we identify >90% of pathology in a single pass through the CT examination. How we can improve your pick up from <50% to higher levels. How we get your answers to score maximum points. Just like the viva course, we want you to get 7s or more not 6s. Every 7 you get is a huge compensation for any marginal cases. You want to pass this section of the exam comfortably and preferably carry a point forward to compensate for any hiccup in the rapids or viva. This section is technical but it is also a fair reflection of your training to date. If that has not been optimal you will struggle. The course is set up to maximise your teaching time but also give you applied practice in the exam nature. It would be easy to set up some packs and let you do 3-4 complete exams, give you the answers and that is it. But we want to maximise your technique and personalised learning - that is much more effort, but more helpful for you and more satisfying for us. The cases we use are DICOM cases. These cases are excellent cases selected from thousands of digital teaching cases of our years of accumulated material. They have been tested on generations of trainees! Prior to the course you receive instructions to download free DICOM software on to your laptop computer (PC or Mac Osirix). On the course day we provide 21.5 inch imacs running Horos (or equivalent Osirix) so you get an experience comparable to the exam. The precourse part of the course sends you a set of DICOM cases to do a baseline written case exam. You send the answers to us and we will mark them and give you feedback. If you prefer not to be assessed that is OK, we will go through the answers anyway, but doing so allows you to get some personalised help and lets us understand your level. On the course we initially discuss our time-tested strategy for the exam, then we will do some more cases interactively together to show best approaches to the cases. Before and after lunch we do a couple more full papers and discuss the answers and scoring. We finish the day with a session rapidly going though a selection of high yield, tricky or combo cases. The course does not end on the day! Finally we give you an additional final exam set to review at home post-course with the model answers for you to self-assess, but we are always available by email for your assistance. Our commitment to you is to use all ourexperience and skills to improve your abilities for the exam. Our satisfaction is you feeling you got what you needed.